Templar Skis may be the first "Crowd-Funded" ski company startup (let us know if you know of others!). Jan Kowalczewski submitted his project to Kickstarter.com (click HERE for the details of the campaign) and raised more than $30,000 CAD to fund an initial production run (outsourced to the same company making DPS's carbon and hybrid skis for years), t-shirts, promotional materials, website and other essentials for a ski company. 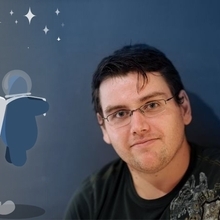 On October 24, 2013, the money was raised, and the project went into full-steam-ahead mode. Four initial models were produced and launched into the public realm to get feedback and response from skiers throughout North America. The wood core and carbon components, as well as the chassis design, vertical and flex profiles are exotic and unusual, unlike other skis we have examined here at ExoticSkis.com. (See the snapshots below to see what we mean by the flex and vertical profile.) Innovative design, innovative business startup business model and innovative approach to manufacturing add up to an interesting company and products. "...This is the Templar Ski Full Carbon Big Mountain Powder ski that lets you bomb down huge powder slopes – it takes its name from medieval explosive devices. The Petard is a Full Carbon charging powder ski. The only laminate we use is carbon it makes our skis perform more consistently and will maintain the flex of the ski for a longer period of time. With plenty of float and pop, this stable ski allows you to bomb down a mountain without compromise. This is not a ski for slowly floating in powder but rather for rapidly descending with big mountain lines. Key features of the ski include a soft camber dual low profile rocker with a rather short turn radius with a unique spline edge design. This radius lends to quicker turns and more versatility on less than ideal conditions. At 120 mm underfoot this ski is surprisingly light with incredible torsional rigidity for a ski of this nature, all thanks to the unique 3 wood core and carbon bracing system. Like all Templar skis this ski was initially designed using Finite Element Analysis to fine tune the design and includes a highly torsionally stable semi cap design that improves the ski’s durability. All Templar skis come with the legendary guarantee (if anything breaks you get a new ski)." The Templar Petard is an addicting drug. The more you push it, the more it teases you to push harder in uneven, cut up, skied out surfaces. Athletic, charging skiers will like this ski more than the passive pleasure-riders. You might find yourself reaching for the Petards on days when it's not really a powdery surface, and not know why...it's a gut reaction after skiing them for a while. They demand to be driven. Weakly riding them won't reward your pleasure centers. Get it up to speed and drive it like you mean it and you will end up like a rat pressing the bar over and over for more rewards. The carbon-frame chassis in the Petard created by Jan Kowalczewski shows its potential for hard-charging skiers looking for a wide-body platform. Jan says the Petards are the most popular model, and it's easy to see why. Not a ski for everyone. Shrink-wrapped and bound with Templar-logo ski straps, the skis had a very professional look right out of the box. 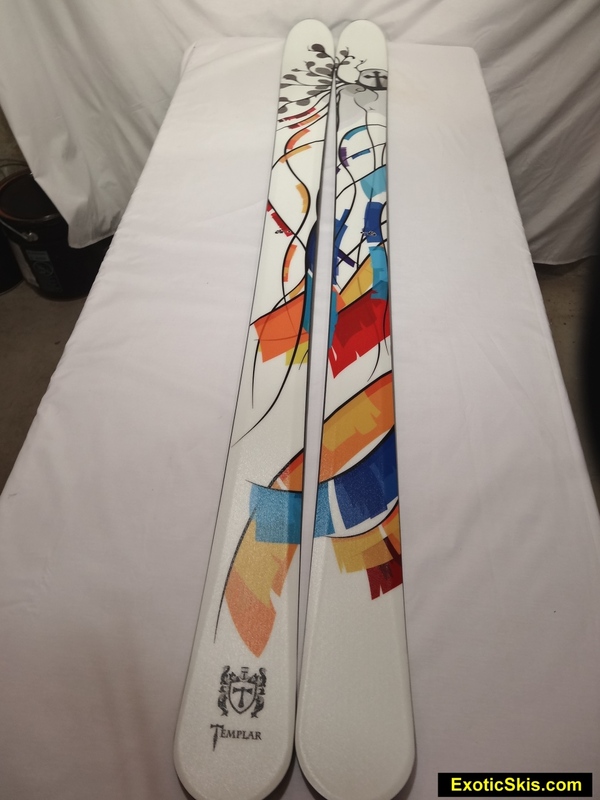 Tearing the shrink-wrap off revealed a beautifully finished set of skis with some of the most vibrant graphics colors we have seen. Matte-textured topsheet with an interesting semi-cap, semi chamfered design. The skis were sharp and well-ground, ready-to-roll right out of the box. The second thing we noticed about the Templar Petards, like the narrower Templar Knights and Templar Nobles we tested last season, was the serious camber. The camber is highly unusual, both in size and strength. These characteristics raise both curiosity and initial skepticism (no need for skepticism...like the Nobles and Knights...more on that later). Hand flex of the ski reveals a stiff forebody, midbody and late-midbody, with a slightly "hinged" tail of somewhat softer flex. Torsional strength is best described as "intensely strong". Giving the unmounted ski the "hand-gong" test showed the ski to have a resonance with a high-pitch common in many carbon-intensive constructions, and a high-frequency buzz which quickly dies diown, almost like a musical instrument muted after the initial note. Again, a very intriguing design and behavior, without ever getting it on snow. It just feels like a charger. Eastern corduroy, packed powder and hardpack groomers, ungroomed packed powder with small bumps, shin-deep to knee-deep powder conditions, both smooth and bumpy. Windpack, crust, chalky wind buff, fresh and old powder. Cut up crud and junk. Some icy patches. The Petards are 120 mm underfoot, and 144mm at the widest tip point, so they are not hard piste carvers, but for their size, they would set a very secure, unwavering edge grip if rolle up, pressured into the camber and held into the surface. Let the camber relax, and the ski wants to arch off the snow, leaving the tip and tail to handle the higher-pressure contact points. Jump on the center of the ski and it will bite into the surface with authority and hold its line until you release it. This ski wants to be "in" snow, not "on top" of snow, so if you casually ride it, tip the ski on edge lazily without any pressure, it will go straight like most skis having this size and geometry. Pay attention, drive the ski into a turn on hardpack and it bites and will hold the line you set with authority....not like a GS carver, but like a torsionally strong big mountain powder ski. Its authoritative edge hold integrity across variable hard surfaces is perhaps one of the best in its class due to the torsional rigidity and highly cambered midbody. Vibrations are controlled very, very well, with essentially zero buzz anywhere along it chassis , and it never vibrates off-line at speed on hardpack, but it has a definite "ring" to it on the hardest surfaces like many carbon-rich constructions. Changing directions quickly on hardpack is accomplished with a punchy style to get the body to flex, bite and rebound where you direct it to go, which it does more rapidly than pretty much any other ski this size. Lazy commands result in lazy behavior in the Petards. Athletic commands result in athletic behavior on hard surfaces. Top marks for security underfoot for such a powder-sized design. Mixed conditions essentially don't exist when driving the Petards. Crud hunters will love the big Templar. Get the body under pressure, tracking in the desired trajectory at any speed and you can pretty much ignore any kind of snow surface you run across. Stable, controlled, composed tracking behavior with zero deflection. Slightly bumpy surfaces result in a very responsive rebound throughout the ski due to its carbon U-frame and energetic core, so it can feel like you understand everything going on under your boots, but it's never, ever nervous or darty feeling...just responsively energetic. Compress the ski's camber into a depression or banked bump, release it and it has serious acceleration and power at a level pretty much unheard of in most "powder skis". This is a ski designed to slay any kind of surface irregularities without feeling "planky" or "battleship-like". High-tracking horsepower is a good way to describe it. The Petards reward an active, atheletic pilot, and they can get you going at speeds higher than you might normally ride because they feel so secure underfoot. The high-level responsiveness might have some less-fit skiers heading for the bar after a half-day on the Petards in charging mode, but they will also thrill the athletic skier looking for a thoroughbred to cut through skied-out surfaces all day. Like the other Templars we tested, the Petards are a relatively stiff and strong ski, so bumps are not absorbed, they are traversed with impact. The stiff midbody directs that energy to the pilot who needs to know where he or she wants to go. The high-camber design creates a powerful leaf-spring effect when the bump size matches the ski length, and if you press the Petards into a trough, you need to be ready for a powerful launch and fun ride. This is not a ski that follows the flow of bumps like water...it bounds or pounds across them. Don't get in the back seat in the bumps. This is the same description as the Knights (100mm waist). The Templar Petards have some tip dive in the softest powder conditions because they are relatively highly cambered and stiff and lack a significant tip rocker. The faster you go in 3D snow, the more they come alive and plane, yet retain a knife-like feel rather than surfboard feel. The surface area of the Knights is perfectly large enough for respectable powder floatation, but when you compare the ride of softer, less-cambered, more fully rockered powder skis in powder to the Knights, the Petards feel a bit balky at slow speeds (hence the target category of "Big Mountain Charger" rather than "Powder Surfer". They are perfectly well behaved and completely effective, and get more friendly in powder the faster you go. Like the Knights, get the Petards into some windpacked or crusty powder conditions, and ride them with a powerful, center-biased stance, you can navigate unfriendly conditions with authority and security which softer, less cambered designs would find hard to achieve as they loose their composure and support underfoot. If I skied champagne fluff all day, I would pick a surfier design. If I was likely to run into variable powder mixed with windpack, cut-up powder, buff, crud or anything remotely possible to cause less-than-Nirvana feelings, I would grab the Petards. The Petards are a little bit of a handful in tight trees due to the stiffness and urge to find open territory. A thoroughbred happiest running hard with a skilled jockey at the helm who craves mastery over any kind of uneven surfaces. The harder you drive it, the more thrilled it gets. Seemingly endless energy for rowdy activities. Perhaps offer a 191cm or 195cm model for serious speed addicts on big open terrain, and a 178cm model for hard-charging smaller people. 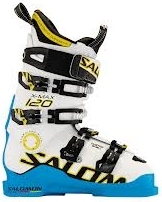 This is a strong, powerful, energetic design for high-performance skiers who like a drive their skis and have a fearless ride though mixed surfaces. Intermediates will find it somewhat demanding or balky or unresponsive at slow speeds. Charging-type skiers will find they have a high-octane tool at their disposal. Passive skiers will not enjoy it compared to most mainstream skis out there in the same class. This ski likes open terrain, despite is 20m radius specification. If you drive your skis hard and prefer a charging ski, you might love this ride. If you want an easy, loose-feeling, surfy powder ski, this is not your ticket.